Synopsis: Ben Richards is out of work and out of luck. His eighteen-month-old daughter is sick, and neither Ben nor his wife can afford to take her to a doctor. For a man with no cash and no hope from the poor side of town, there’s only one thing to do: become a contestant on one of the Network’s Games, shows where you can win more money than you’ve ever dreamed of—or die trying. Now, Ben’s going prime-time on the Network’s highest-rated viewer participation show. And he’s about to become prey for the masses…. One of the best things about this Stephen King reread project is discovering unread novels by my favorite author. King has written upwards of sixty novels at this point, and I've only been reading him for a few years now, so naturally I still have a bit of catching up to do. 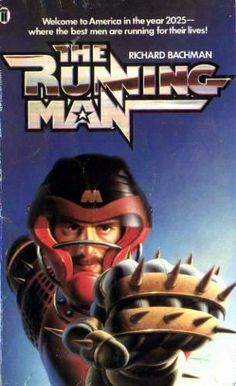 Like Roadwork before it, I'd never read The Running Man (and I still haven't seen the movie, but I want to -- if only to revel in its horrible '80s cheesiness). And like Roadwork, I really enjoyed The Running Man, even though they're rather dissimilar. 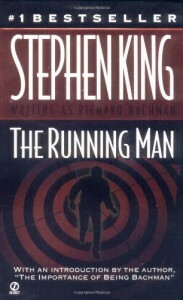 The Running Man is all story with no extraordinary character development (the story is King wrote this in three days during a school break during his time as a teacher), whereas Roadwork is a heartbreaking examination of what could send one lonely man over the edge -- a sort of warm-up for The Shining, if you will. 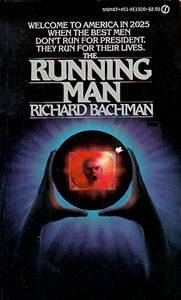 Of the two I certainly prefer Roadwork, but The Running Man is a fine entry from the Richard Bachman pseudonym. Like The Long Walk, The Running Man is a dystopian tale set in a bleak future America. Unlike The Long Walk, a year in which The Running Man takes place is specified from the start -- 2025. Because this was written in the early '70s and published in 1982 under the Bachman name, this novel reaches over five decades and makes some predictions . . . and some of them ain't too far off. In the society presented in this story, the American people have become working slaves to the upper class -- working long hours for low wages, therefore not having enough money to buy medicine and other essentials -- whose only happiness comes from reality shows everyone is hooked on. Most of them are violent in nature, but none beat The Running Man -- the program for which our main character, Ben Richards, has been selected after applying in hopes of earning money to pay for his young daughter's medicine. Ben is a sad everyman thrown into extraordinary situations -- something King is the master at writing about. He certainly doesn't let the reader down here. This is a very brief and very powerful early novel from King. Written way before the age of reality TV, this is a novel that resonates more in 2016 than ever before. It's a tense, hold-on-to-your-seat read that will have you flipping pages faster and faster as the story progresses, and the ending will probably leave you in chills. I know it did to this reader, he who lives in a post-9/11 world. Don't go into this one expecting much depth -- there isn't much of that to be found. This is mid-tier King, and that's perfectly fine. Sometimes one needs a helluva enjoyable read that doesn't try too hard to impress. This story is about one man on the run from an entire nation out to get him, and what's more intriguing than that? King connections: The town of Derry, Maine -- site of future King novels It and Insomnia -- is referenced a few times. I wonder if these references were in the early drafts of the story or added in for the '82 first edition. My guess is the latter. Up next: We're looking at one of my very favorite King books -- it's Different Seasons!